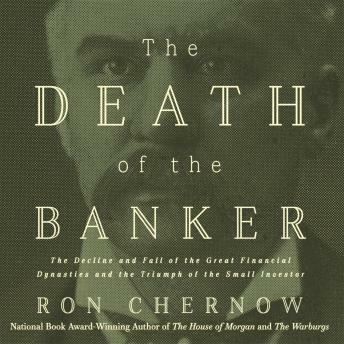 With the same breadth of vision and narrative elan he brought to his monumental biographies of the great financiers, Ron Chernow examines the forces that made dynasties like the Morgans, the Warburgs, and the Rothschilds the financial arbiters of the early twentieth century and then rendered them virtually obsolete by the century's end. As he traces the shifting balance of power among investors, borrowers, and bankers, Chernow evokes both the grand theater of capital and the personal dramas of its most fascinating protagonists. Here is Siegmund Warburg, who dropped a client in the heat of a takeover deal because the man wore monogrammed shirt cuffs, as well as the imperious J. P. Morgan, who, when faced with a federal antitrust suit, admonished Theodore Roosevelt to 'send your man to my man and they can fix it up.' And here are the men who usurped their power, from the go-getters of the 1920s to the masters of the universe of the 1980s. Glittering with perception and anecdote, The Death of the Banker is at once a panorama of twentieth-century finance and a guide to the new era of giant mutual funds on Wall Street.